After missing its own 2018 deadline for shipping a multi-device wireless charger, industry speculation now has the AirPower charging pad on the assembly line and ready to ship soon. 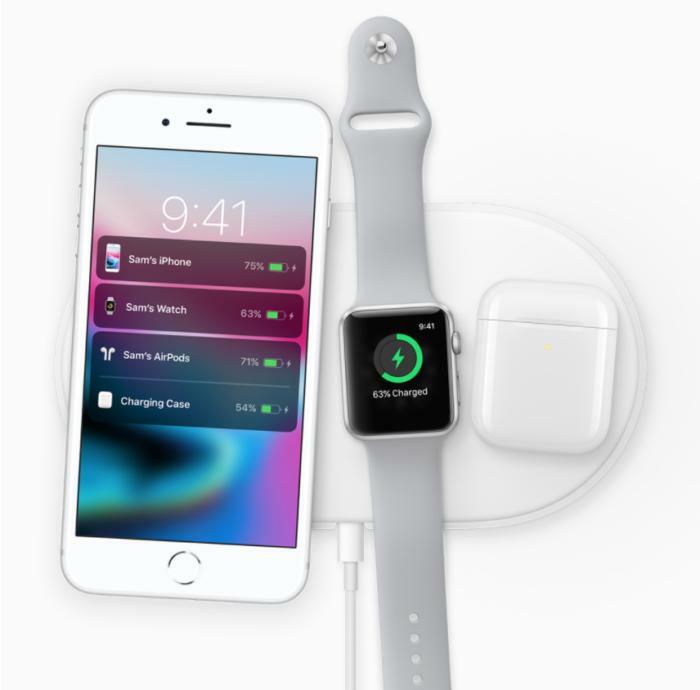 Apple's yet to ship AirPower mat has been marketed as being able to charge an iPhone, Apple Watch and AirPods simultaneously. After failing to meet its own shipping timeline in 2018, Apple is now thought to have two manufacturers ramping up production of its AirPower wireless charging pad, according to a Hong Kong-based website that specializes in device charging news. 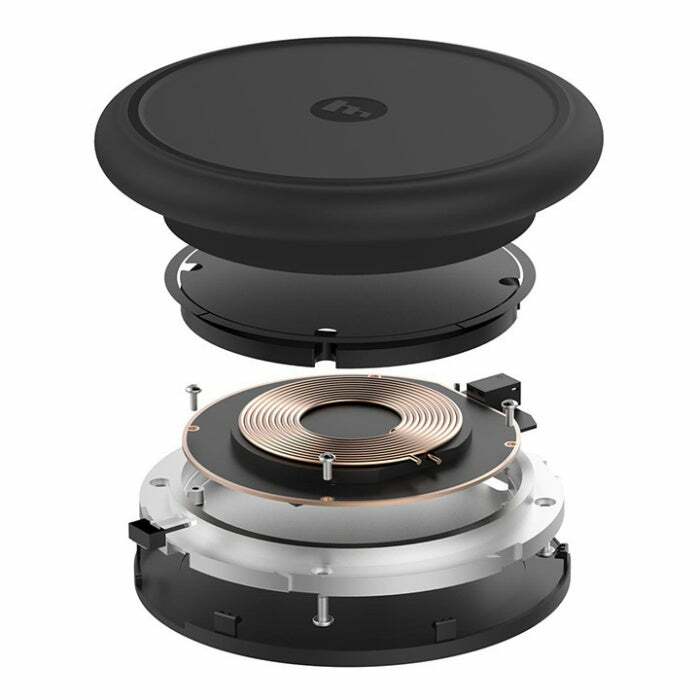 As first reported by MacRumors, the website ChargerLAB tweeted out this morning that it had "just learned from credible source in supply chain" that Chinese manufacturer Luxshare Precision has begun manufacturing the AirPower multi-device wireless charger. ChargerLAB followed its initial tweet with another claiming a second Apple supplier, Pegatron, will begin manufacturing AirPower chargers on Jan. 21. ChargerLab cited a Pegatron employee who said AirPower will have three layers of copper wireless charging coils, in an "8-7-7" configuration from bottom to top, which will enable it to charge an an iPhone 8 or iPhone X, an Apple Watch Series 3 or 4 and AirPods via the charging case. A multi-device wireless charger from Holland-based Zens. 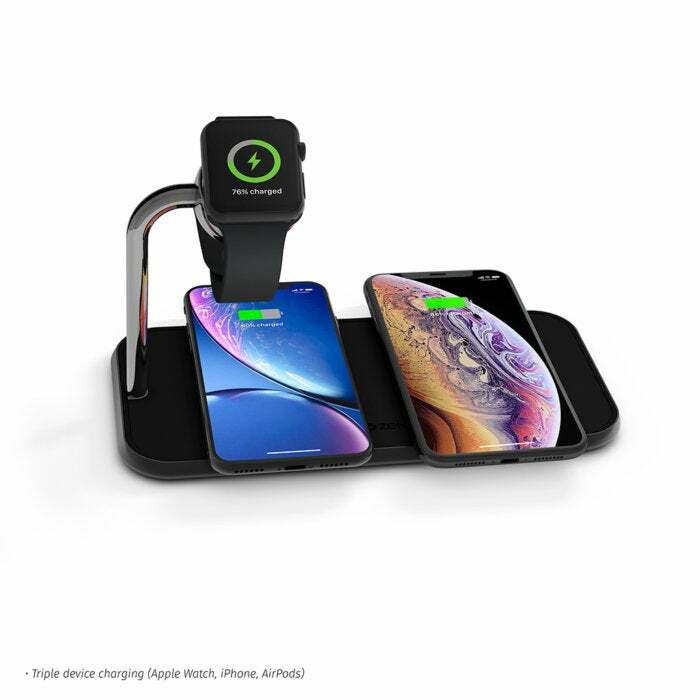 Its Dual+Watch Fast Wireless Charger can charge two smartphones and an Apple Watch at the same time. "Unfortunately, I think it will be at least $150," ChargerLab tweeted. While there may be more than a dozen multi-device wireless chargers technically available now, most do not charge both smart watches and smartphones. The accuracy of ChargerLAB's past tweeted rumors has been hit or miss. MacRumors noted ChargerLAB accurately reported that third-party Apple-certified Lightning to USB-C cables would be available in early 2019, and in fact they were introduced at CES last week. Conversely, in December, ChargerLAB reported the entire iPhone X lineup would come with a faster 18-watt USB-C power adapter. The charger shown on the ChargerLab website was, in fact, for a 2018 iPad Pro. If ChargerLAB's latest tweets prove correct, are there still users prepared to spend top dollar for an Apple-stamped wireless charger? Jack Gold, principal analyst with J. Gold Associates, doesn't believe the delayed AirPower release will affect sales. "Apple makes a ton of money on accessories, so anything it can do to offer popular accessories that it can sell is a good thing," Gold said via email. "If it's designed well (very likely) and works well (Apple doesn't usually offer shoddy products) then there will be a ready market for the product." Belkin's BoosUp wireless charging pad is similar to others; it contains a copper transmitter charging coil, a chipset to control the power delivered to a device, and foreign object detection tech to ensure objects that shouldn't receive a charge don't. In September, 2017, Apple announced it would ship its AirPower product by the end of 2018. Expectations grew with each passing quarter last year that the charging pad would finally arrive. But Apple missed its own deadline and pundits surmised the company was struggling with technical issues, such as how to regulate different charging requirements on a single pad using the Qi wireless charging specification. Industry pundits also noted Apple had purged the AirPower image from virtually all of its webpages. The only image currently available of AirPower on Apple's webpages. Broadly speaking, there are three types of wireless charging, according to David Green, a research manager with IHS Markit. There are charging pads that use tightly-coupled electromagnetic inductive or non-radiative charging; charging bowls or through-surface type chargers that use loosely-coupled or radiative electromagnetic resonant charging that can transmit a charge a few centimeters; and uncoupled radio frequency (RF) wireless charging that allows a trickle charging capability at distances of many feet. Both tightly coupled inductive and loosely-coupled resonant charging operate on the same principle of physics: a time-varying magnetic field induces a current in a closed loop of wire. Developed under the Wireless Power Consortium, Qi is the most popular wireless charging specification and is supported by more than 230 companies, including Samsung, Sony, Delphi Automotive and Energizer. Apple became a WPC member last year. The Qi standard supports both tightly coupled, or inductive, wireless charging and loosely coupled, or resonant, wireless charging, which allows an enabled mobile device to be up to 1.75 inches away from a charging pad and still receive power. That distance allows mobile devices to be more loosely placed around pads in order to charge rather than needing to be placed in an exact spot to receive power. But the leeway is still tight. When Apple first announced the iPhone 8 in 2017, it recommended wireless charging products from third-party providers Mophie and Belkin. 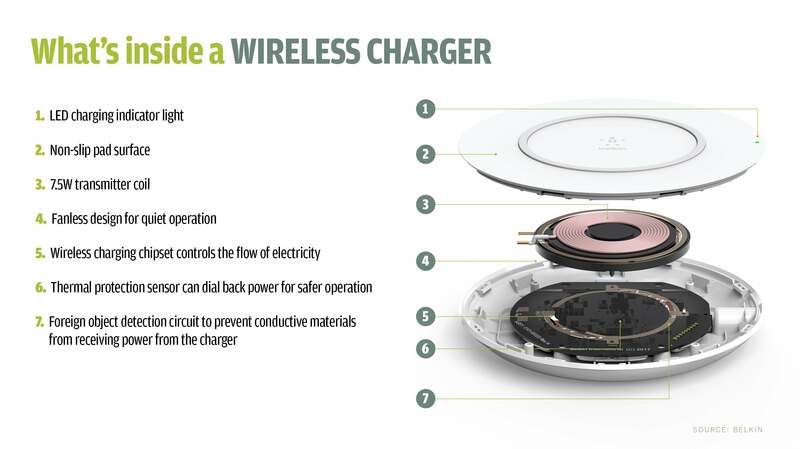 An exploded image of a Belkin wireless charging pad shows the copper coil in the center responsible for transmitting electromagnetic power to enabled mobile devices. Since that time, a variety of third-party providers have introduced wireless chargers that can power up both an iPhone and an Apple Watch. But none have introduced a product that can handle all three of Apple's products: smartphone, watch and earbuds. In December, Computerworld reviewed four multi-device chargers capable of powering up smartphones and smart watches. "The market has moved on and there now are a lot of vendors offering wireless charging, including for Apple products, so the market is much more crowded and competitive now than it would have been if they brought the product to market a year ago," Gold said. "But the share of wireless charging compared to wired is still pretty small, so there is a very large potential for Apple (and others) to sell to." This story, "Apple’s AirPower wireless charger may already be in production – and shipping soon" was originally published by Computerworld.